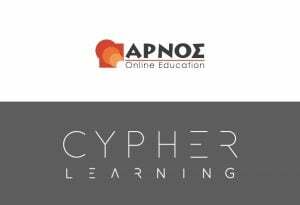 CYPHER LEARNING, a company that specializes in e-learning platforms, announced its partnership with Arnos, a private educational institute from Greece with more than 30 years of experience in Education. ARNOS Online Education provides online courses with a rich educational material that includes more than 50.000 video lessons, pdfs, online tests and quizzes and more. These courses are available for students and teachers from all the educational levels, from primary school to higher education. With more than 10 years of exclusive experience in the elearning aspects, ARNOS has earned the title of the premier online education provider in Greece. Arnos needed an appropriate platform where they could create and host their classes and found CYPHER LEARNING to be the perfect solution. CYPHER LEARNING has two products: NEO an LMS for schools and universities and MATRIX, an LMS for businesses. Both products are known for their beautiful user interfaces, comprehensive set of features, pricing that provides great value for money, and professional support staff. Arnos will become a NEO client and authorized reseller. The company will use NEO to host their classes and take advantage of the many features that the platform has to offer such as a graphical class catalog, gamification, curricula and proficiencies, mobile apps, and more. NEO is a world class, award winning LMS that makes it easy to create great classes that students will enjoy anytime, everywhere. NEO is used by over 20,000 organizations, support 40+ languages, and has millions of users. The partnership between CYPHER LEARNING and Arnos will help both companies further expand their reach, by promoting NEO and Arnos classes, to schools and organizations in all of Greece and beyond. CYPHER LEARNING is a company based in San Francisco that is committed in providing the best learning and teaching experience to schools, universities, businesses, and organizations around the world through its e-learning platforms. CYPHER LEARNING has two products: NEO an LMS for schools and universities and MATRIX, an LMS for businesses.